1) Cash Donations to the Foundation to defray the costs of the Byzantine Iconography that has been drawn and painted inside St. Nicholas Chapel. We are looking for contributors who consider this endeaver as a worthy recipient of their charitable tax donations/deductions. The donees name will appear on the chapel premises. 2) Straight in cash donations to the Foundation to sustain its operation and good works in upholding and perpetuating the Greek Orthodox religion, customs, traditions and culture. 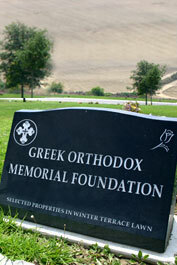 3) The purchase of grave sites in the Greek Orthodox Section of Rose Hills Memorial Park which comprises of the following sections: Mission Terrace, Winter Terrace, Morning Star Terrace, Morning Star Terrace Estates, Morning Star Estates-Monuments. 4) The Thyranoixia (opening of the doors) was scheduled and celebrated by his Eminence Metropolitan Gerasimos and several of the invited area priests, on Saturday, June 10, 2006. A hosted light luncheon followed.